After a tumultuous season two years ago, the coaching carousel was not all that active in the off-season this year. Sure, there were some awful coaching jobs that got rewarded with pink slips (John L. Smith, anyone? ), and there was plenty of drama with the situation in Alabama. In all seriousness though, with only 13 firings last season, many of the coaches on the hottest of chairs got the job done and are now a little more comfortable. In reality, the same situation exists for 2007-08. There are not too many coaches on the hot seat with something to do this year, and no imminent firings apparent. A quiet offseason makes this preview article very boring, but given the turnover of coaches in some schools, that might be a good thing. There will never be 119 good fits of coach and university, but 20% of the ranks shouldn’t be fired every year either. With that said, let’s take a look at the coaches with something to prove as they sit on the warmest hot seats going into the 2007 season. The first five names below are the hottest seats going into 2007, and then I will speak briefly about the hottest seats in other conferences not represented in the top 5. Coach Nutt escaped the fiery wrath of the 2006 SEC hot seat by winning 10 in a row after a season opening shellacking by USC last season. 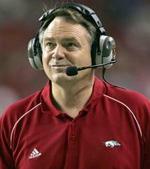 Despite a solid record in 9 years, Nutt was almost fired after back to back losing seasons in 2004 and 2005. Nutt could’ve escaped the hot seat this year with that 10-1 start, but the Razorbacks stumbled against the elite teams in the country and fell to 10-4 after losses to LSU, national champion Florida, and Wisconsin. Of course Florida did win the title and Wisconsin was by far the best team shirked by the BCS rules, so perhaps these losses were not so bad. Another 10 win season would probably move Nutt well off the hot seat, but a collapse in the SEC this season would spell the end of Coach Nutt. Although ULM has never been a particularly safe place to coach, Weatherbie has managed to make it into his 5th year at the helm. Growing pains caused the 1-11 record in 2003, but the fans have expected more since 5-6 marks in 2004 and 2005 and have not received it. At least they beat rival UL-Lafayette 3 out of the past 4 seasons, but the one loss was the most painful as it cost ULM a conference title, bowl berth, and winning record. Weatherbie must show that he can compete at the top levels of the Sun Belt, or else he might be gone next season. The joke of the ACC has not changed with expansion, as the Blue Devils are one of the worst five programs in major college football. Duke is a tough university academic-wise, but that has not stopped them from getting championship caliber basketball teams (and it does not stop Notre Dame in football either), so the focused-on-academics argument is a poor excuse. A 3-30 record in three seasons with only one win in the ACC is just unacceptable, and the team has not won since September 17, 2005. The 20 game losing streak has to end soon, and I think Coach Roof needs 2-3 wins to avoid hiring the moving vans in 2008. Time for your fantasy college football education - Fantasy College Blitz - because in college, everyone scores! Coach Genyk did not bring winning back to Eastern Michigan, but his first two seasons have to be considered a success at 4-7 considering where the Eagles were in 2003. EMU took a big step back to “just another directional Michigan” with a 1-11 record last season. Patience may not have waned even with this setback if not for the sudden turnaround of rival Central Michigan. Now EMU fans have seen a real turnaround can be done, and Coach Genyk needs to milk some more wins out of 2007 to stay in his position. Robinson’s team looked much improved from the 1-11 mark in his first season when they started 3-2 (and should have been 4-1 had they taken care of a goal line stand against Iowa), but then things fell apart again. With very few starters returning and a solid batch of mid-level Big East teams, the only really winnable game is at home against lowly Buffalo. Robinson is probably safe with all the inexperience and youth for another year, but a winless season could bring swift change and is not that far-fetched in 2007. Still prepping for college fantasy football the hard way? Read top insight from Fantasy College Blitz. The Aggies were winless in Coach Mumme’s first season, but then came back to a 4-8 record last year, winning their last two games. Better results in conference need to happen soon, or else NMSU will be looking elsewhere for a leader. Nobody in the WAC is really in trouble this season it appears, but another winless or one-win season may be enough to get a pink slip here. Despite a slowly improving record in the past 4 seasons, Baylor is still the trash in the South division, and their 3-5 conference record last year was deceiving as they went 0-5 against the South and 3-0 against the pathetic North division. All of those losses were in the double-digits, and 4 of the 5 were by four touchdowns or more. Numerical improvement has not made Baylor any better of a program, and Coach Morriss needs to put together some meaningful wins to stay in 2008. The Mustangs fan base rightly believes this team should be competing for bowl berths and league titles, but the past three seasons have shown nothing but mediocrity (15-20). Coach Bennett has the right team to compete in 2007, but another middling season would be devastating to the program. SMU would then presumably move on to another coach. After not winning more than 3 games for a handful of years, Stoops led the Wildcats to a 6-6 record in 2006. With the only really good teams in the conference currently being California, USC, and Oregon State, the Wildcats need to continue their improvements, or else Stoops may feel the heat. If Arizona drops back to the cellar this season, then Stoops is likely gone. Coach Lubick has been around for 14 seasons, which is the longest tenure on this list, but the Rams have not had a winning season in the past 3 years, and some rumblings have begun about Lubick losing his touch. Losing your last 7 games of a season when things have not gone well in recent years can be enough to turn the fire up on anybody, including veterans. Another win against rival Colorado might up the morale enough to save Lubick for another year. The Big Ten has the most stable set of coaches right now, and it will be shocking to see anybody fired after this season now that the joke of the John L. Smith era is over at Michigan State and Minnesota is sporting a new coach. Lloyd Carr was here last year, and while he has dropped to 1-5 against rival Jim Tressel, Michigan did go into the showdown 11-0 last season, and a Rose Bowl always quiets the critics. In a tough decision, Zook gets the nod as the hottest seat in the Big Ten. The Illini have lost 15 out of 16 Big Ten games, and the fans are missing the glory days of 2001 when they last won the conference (the last non-powerhouse team to do so, as Michigan, OSU, Iowa, and Penn State have shared all titles since then). Zook appears to be able to get his players fired up for the big games, as they gave Wisconsin and Ohio State big scares at the end of last season. It’s hard to believe the 2008 coaches will be different than this set in 2007, but Zook is most likely to go if no progress starts appearing in the win column. It speaks volumes to how cool the hot seats are this season when the hottest seat in all of college football is a coach who is a lot closer to keeping his job than he was a year ago, that being Houston Nutt at Arkansas. Not many of these coaches are going to have a realistic chance to win their leagues or even go to bowl games, but each needs to keep their programs moving in the right direction, or else they will be the coaches riding the old carousel next season. Please feel free to email me about the Big East preview from earlier this week or this article. I appreciate all feedback, and I look forward to bringing another season of articles to you, the readers. See you next week when I’ll be previewing the Big XII.